Albeit I'm a bit ashamed of not liking seafood much, I also don't hide it. It's for this very reason that after more than eight years of grilling here, you have not seen one planking recipe. I've always equated planking with seafood (when searching for recipes, it can be hard to get many beyond planked salmon), but after seeing the breadth of what my blogging buddy Mike was doing over at Another Pint Please, I formed a drastically different picture of what planking can be. 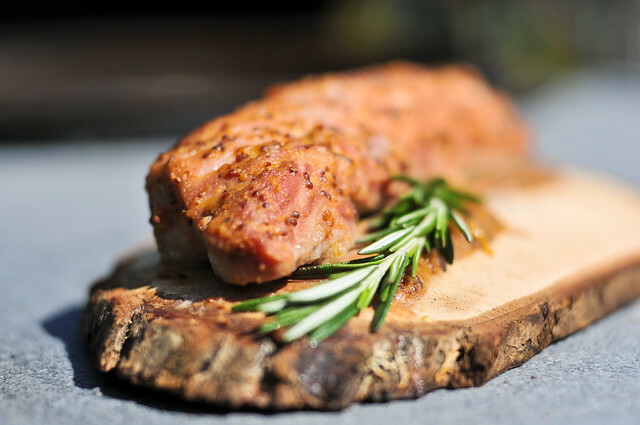 Unlike smoking, which imparts a very distinct flavor to meat, planking is much more subtle, giving a light woodsy taste to foods with a delicate flavor, seafood being the best example. However, Mike was planking everything from steaks to vegetables to chicken and I wanted in on that action. So I procured some planks, generously donated by Afire and meat, and had at it. 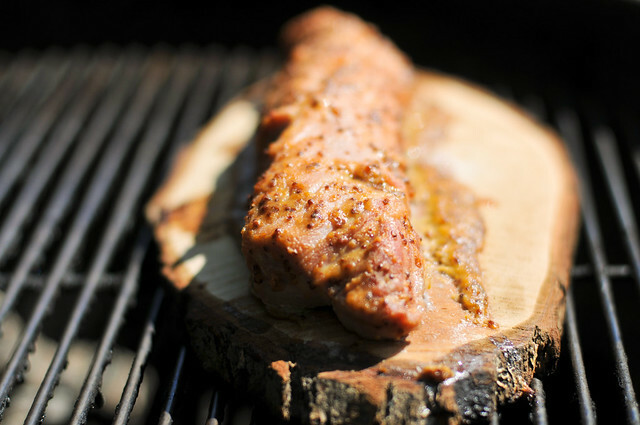 Knowing that getting flavor out of the plank is best done with a lighter meat, I opted to start my planking off with a pork tenderloin. As with most of my pork, I wanted to give this one a brine, and to up flavor a bit I concocted a maple syrup based brine, throwing in a sprig of rosemary and a few garlic cloves for good measure. As the pork brined in the fridge, I familiarized myself with the ways of the plank. 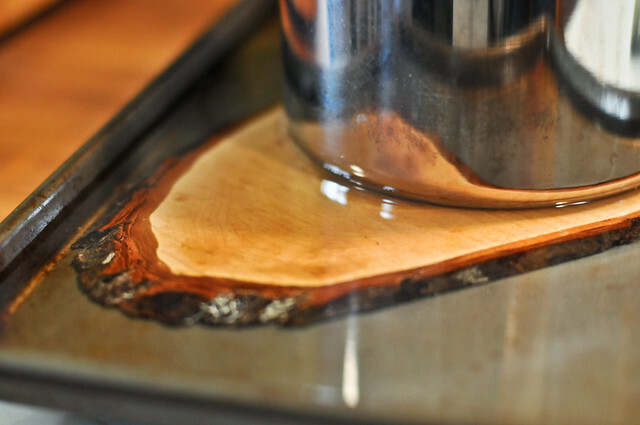 While I've pretty much disavowed soaking wood chunks for cooking—never noticed a big enough difference—it was important to throughly saturate the plank prior to use. With planks, you're not looking for ignition, but rather some slight smoldering, and water logging the wood is the best way to achieve that while the plank is cooking over, or next to, a hot fire. With plank soaked and pork brined, it was the fateful time to marry the two and bring to the grill. Just one last step though, giving the pork a slather comprised of Dijon and whole grain mustard, along with maple syrup. I let the pork cook on the plank over indirect heat until it hit a nice medium at 145 degrees. While I let it rest, I was both enticed by how nice the meat looked resting on the wood it was cooked up, but also a bit disappointed that it lacked the dark crust that the meat otherwise would have had if cooked over direct heat. Any disappear faded as I sliced into the juicy, tender meat, which was just inviting me to dig in. My first bite had me amazed at luscious quality of the meat, which had a faint sweetness that paired nicely with the bit of spice from the crust. Second bite I knew what I was in for, so I started to search for that little lift given by the plank, taking extra time to chew to try to discern the flavor, and there it was. 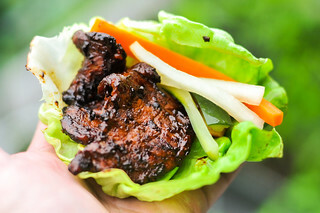 Faint, but present, the plank did add more than good looks as the sweet and spicy pork gained an undertone of woodsy taste that may not be initially apparent, but would lacking if it were not there. So now I have at least one planked meat under my belt (well two, I did a white fish right after this pork) and can't wait to see where else this new-to-me grilling method will take me. 1. 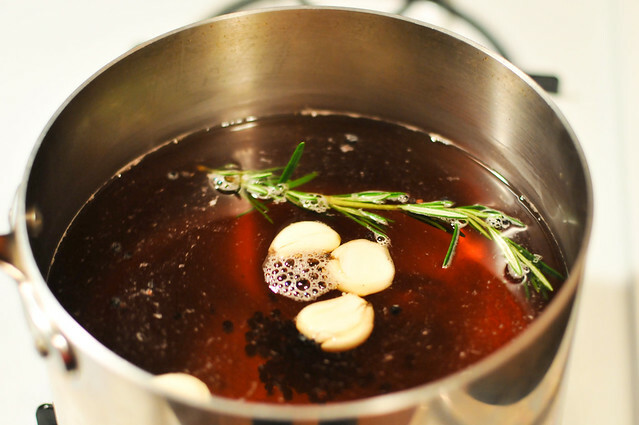 To make the brine, combine water, 1/2 cup maple syrup, salt, garlic, rosemary, and black peppercorns in a medium saucepan. Bring to a boil over medium-high heat, boil for 1 minute, then remove from heat. Let cool to room temperature, transfer to a large, non-reactive container, cover and place in the refrigerator until cooled below 40 degrees. Place tenderloins in brine and brine in refrigerator for 4 hours. Remove from brine and pat dry with paper towels. 2. 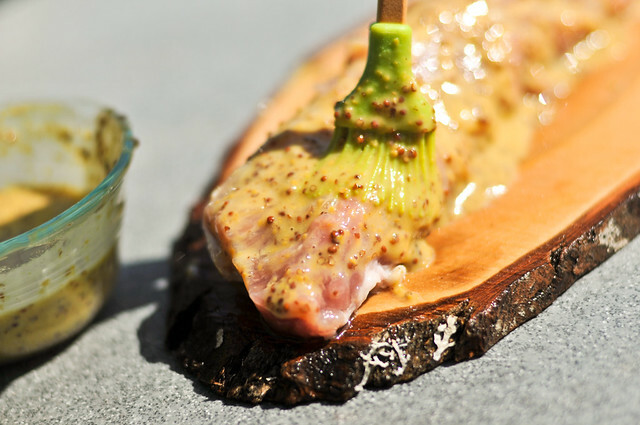 To make the mustard slather, mix together Dijon mustard, whole grain mustard, and 1 tablespoon of maple syrup in a small bowl. 3. Light one chimney full of charcoal. When all the charcoal is lit and covered with gray ash, pour out and arrange the coals on one side of the charcoal grate. Set cooking grate in place, cover gill and allow to preheat for 5 minutes. Clean and oil the grilling grate. Place tenderloins on plank and brush all over with mustard slather. 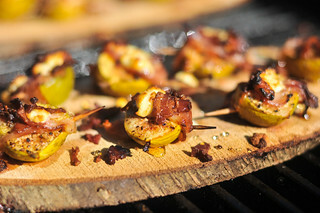 Place plank on cool side of the grill, cover, and cook over medium heat until meat registers 145 degrees in the center. 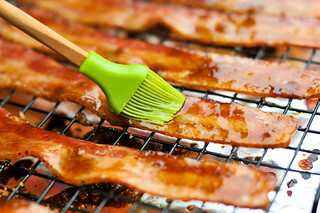 Remove from grill, let stand 10 minutes, slice and serve. I love using planks for seafood - I'm a fan of the cliche cedar plank salmon. 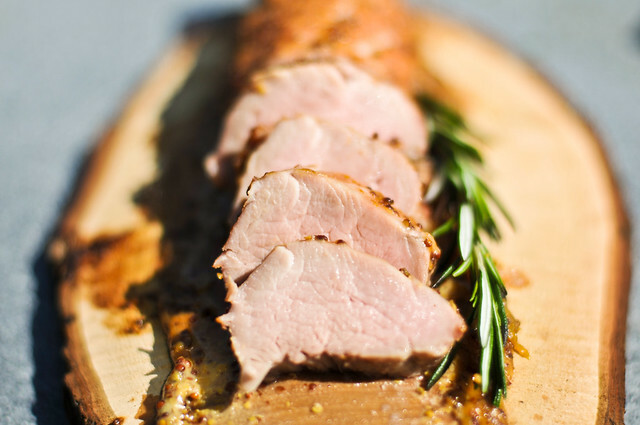 I also love pork tenderloin and I returned from VT with a huge quantity of pure maple syrup, so I'll bookmark this. As usual, awesome. I'm absolutely loving the looks of those planks, too. The presentation is fabulous. 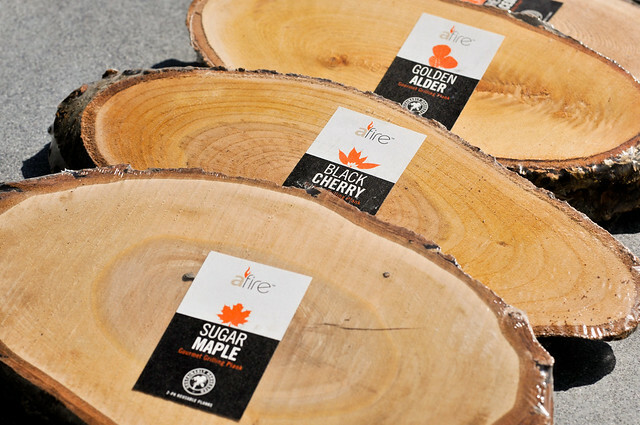 I saw those on The Naked Whiz's site and was very impressed with the Afire product. I'm like you and don't care for fish either so I'd go with something like a tenderloin.